Title: The three-dimensional distributions of Type II Cepheids and Anomalous Cepheids in the Magellanic Clouds. Do these stars belong to the old, young or intermediate-age population? Figure 1. The Period-Luminosity Relationship (PLR) of Cepheid variables identified by Henrietta Swan Leavitt in the Small Magellanic Cloud. The x-axis is the logarithm of the Cepheid periods in days, and the y-axis is the apparent magnitude. 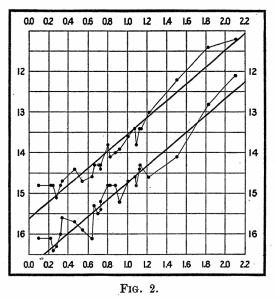 The upper line uses the maximum brightness of the Cepheids in the plot, and the lower line uses the minimum brightness [Figure 2 in Leavitt & Pickering (1912)]. Cepheid variables are definitely a gift to astronomers. They are a class of variable stars that are useful as distance indicators (objects that can help us measure distances because we know what their brightness ought to be if they were say 10 parsecs away from us). Henrietta Swan Leavitt was the first to notice that Cepheids that took longer to go from their brightest to their dimmest and back—that is, they had longer periods—tended to be brighter than Cepheids with shorter periods (see Figure 1). This relationship between period and brightness is called a period-luminosity relationship (PLR). We continue to use Cepheids to measure distances even though we still don’t yet know everything about them. Cepheids are broken up into two classes, generally speaking—Type I or Classical Cepheids, and Type II Cepheids. Type I Cepheids are younger than Type II Cepheids, and have a more structured light curve (see Figure 2) as well. There is also a third class of Cepheids that don’t quite fit into either of the previous two classes called Anomalous Cepheids. The peculiarities of Type II Cepheids and Anomalous Cepheids have made understanding their origin and evolution an interesting problem. 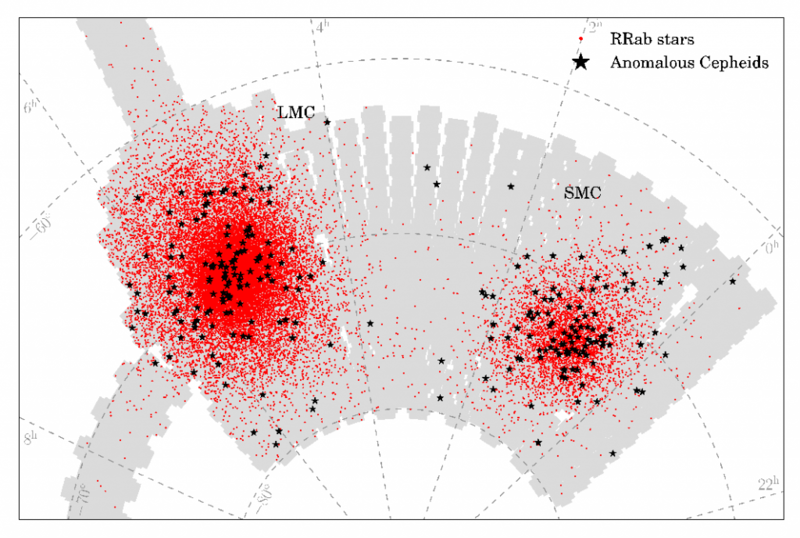 In this paper, the authors attempt to make headway on this issue by studying the spatial distribution of Cepheids and other variable stars called RR Lyrae in the Magellanic Clouds (Large: LMC, and Small: SMC, two of the largest satellites of the Milky Way). Figure 2. Example light curves of the different variable stars in this study. 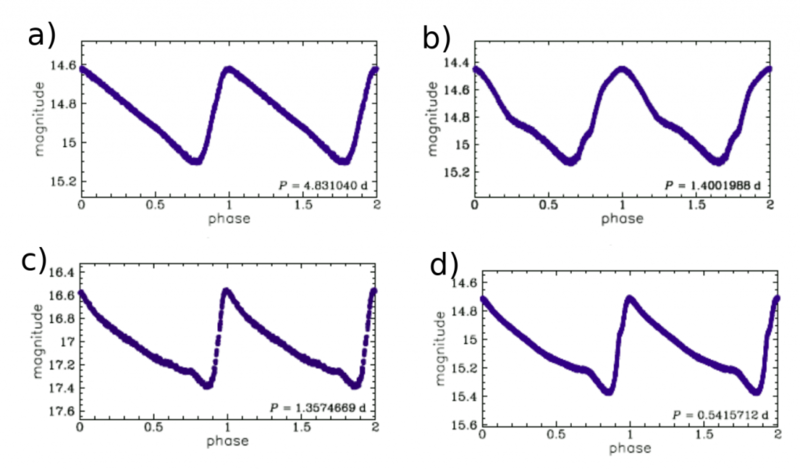 The x-axis in all the plots is the phase of the variable star (showing the particular point of the brightening and dimming cycle at which star was observed), and the y-axis is the magnitude of the star. The period of the cycle is in the bottom right corner of each plot. Plot a) shows the light curve of a Classical Cepheid, Plot b) shows the light curve of a Type II Cepeheid (specifically a BL Herculis), Plot c) shows the light curve of an Anomalous Cepheid, and Plot d) shows the light curve of an RR Lyrae [from the OGLE Atlas of Variable Star Light Curves]. Figure 3. Period-Luminosity Relationships of the stars studied in the LMC. The x-axis is the logarithm of the period in days, and the y-axis is the Wesenheit index. BL Herculis and W Virginis stars are Type II Cepheids, while RRab and RRc are the two classes of RR Lyrae (RR Lyrae ab and RR Lyrae c) [From Figure 3 in paper]. The authors work with data taken of the Magellanic Clouds from the Optical Gravitational Lensing Experiment (OGLE). The data span 25 years, making the Clouds a hotbed for variable star identification. In this paper, nearly 10,000 Classical Cepheids and 50,000 RR Lyrae (another type of variable star that is a distance indicator) are used to constrain the positions of just under 350 Type II Cepheids and about 250 Anomalous Cepheids across both Clouds. The main goal of the work is to check whether the location distributions of Type II Cepheids and Anomalous Cepheids are similar to the location distributions of (younger) Classical Cepheids and (older) RR Lyrae. If they are, then it’s likely that the stars share similar origins. To do this, the authors first determined distances to the stars they were studying, and then used a statistical test to compare pairs of stars in the Clouds. The Type II and Anomalous Cepheids were paired with Classical Cepheids and RR Lyrae. To save on computing time, the authors compared the less understood variables with 1000 samples of better understood variables. 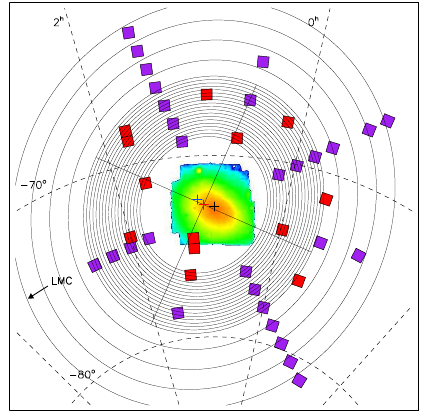 The samples were independent of each other, and were drawn from the available Classical Cepheids and RR Lyrae. Each sample contained three times as many Classical Cepheids and RR Lyrae than Type II and Anomalous Cepheids. To determine the distances to their stars, the authors used the stars’ periods and Wesenheit indices to obtain a PLR and then a distance modulus (see Figure 3). Wesenheit indices or functions can be used in place of magnitude, and navigate the user around the effects of things like interstellar dust that can cause objects to appear redder than they actually are (see this Astrobite for more on them). They do require that an object was observed in at least two filters though. BL Herculis (a subgroup of Type II Cepheids) stars have a distribution similar to RR Lyrae in both the LMC and the SMC. It seems that they may also have a distribution similar to Classical Cepheids in the SMC but this might be due to the fact that there are very few Type II Cepheids to work with in that Cloud. This result suggests that BL Herculis stars are old and likely close to the age of the RR Lyrae in the Clouds. W Virginis (another subgroup of Type II Cepheids) stars appear to be similar to Classical Cepheids in distribution. They are a tad more perplexing—most of them appear to lie in regions with young stars but some of them appear in regions that exclude young stars. Approximating their relationship to RR Lyrae suggests that these stars are likely intermediate age, or a mix of old and intermediate age stars between the RR Lyrae and the Classical Cepheids. Anomalous Cepheids are wily, and don’t appear to trace the distribution of Classical Cepheids. Comparing them to RR Lyrae suggests a kinship but more with the ab RR Lyrae than the c RR Lyrae. The Anomalous Cepheids live in the outer regions of the both the LMC and the SMC, which suggests that they are of an older population like the RR Lyrae. 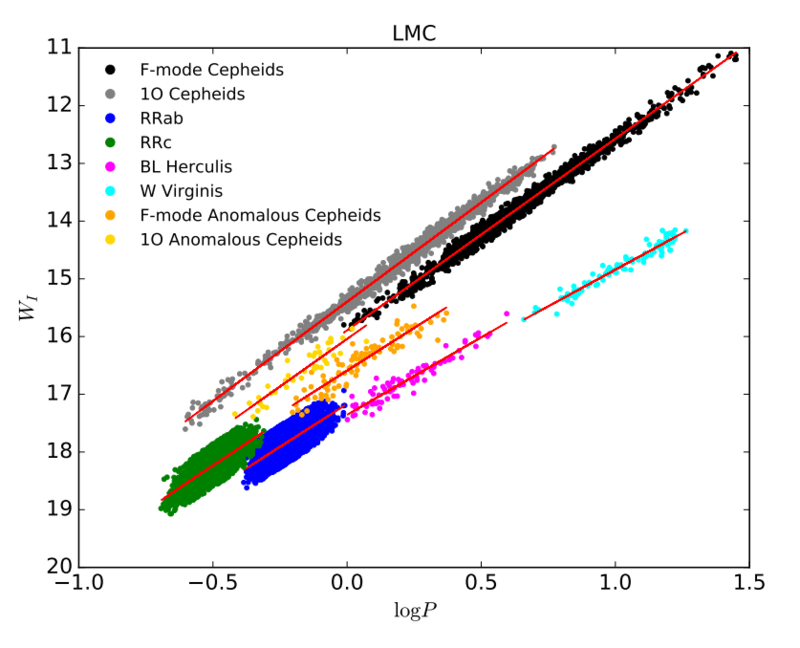 The authors call the results from the LMC more reliable since it simply has more stars than the SMC. Anomalous Cepheids are still ambiguous about their origins but these results suggest that they might be created from binary systems of two low mass stars. Figure 4. The distribution of Anomalous Cepheids (black stars) and ab RR Lyrae (red dots) across the Magellanic Clouds. The gray area is the area of the sky covered by OGLE, also called its footprint. While we don’t yet fully understand how these strange Cepheids evolve, this paper points us in the right direction to learn more. Given how important Cepheids are to constraining the Hubble Constant and understanding how the Universe expands, this is an important problem to solve.